Home Animal Planet event family fish maryland show Tanked taping television Westfield Annapolis Westfield Annapolis Mall Gets TANKED! 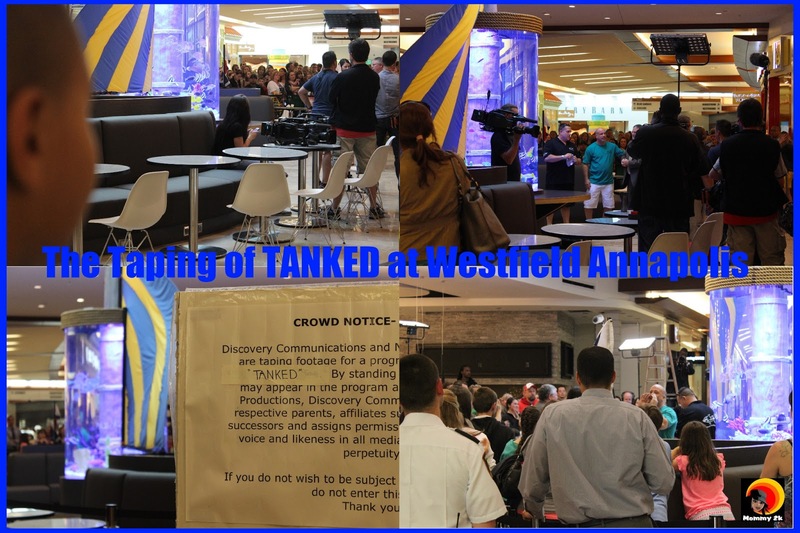 Westfield Annapolis Mall Gets TANKED! Kaden hops in the back of the car as I am stopped in the car rider line. "Hey K! We have to go to the mall." He lets out a huge sigh and disappointment comes over his face. I'm in the front of the car with a devilish smirk on my face, watching his reaction from the rear view mirror. I want to drag this out as long as I can, but I don't want to upset my hormonal tween during the process. "Weeelllllah...we are actually going to the mall to see a taping of that show Tanked that we watch." I glance again in my rear view mirror. Before I can even finish explaining just how this all came about, his face quickly lights up and he lets out a loud, "YESSSSSSS!!!" If there was enough room in the backseat to do a happy dance, I'm sure he would have. Mom with the win!! For those of you who have no clue what Tanked is, let me clue you in a bit. Don't worry. I was once where you were before I sat down with my family and stumbled upon this entertaining, hilarious and exciting show on Animal Planet. As co-owners of Las Vegas-based Acrylic Tank Manufacturing (ATM), one of the country's most successful builders of aquariums and two of Sin City's most imaginative businessmen, Wayde and Brett are tasked with building some of the most enormous and awe-inspiring tanks and aquariums for top celebrities, luxury hotels and casinos, Fortune 500 businesses, private homes and millionaire homeowners across the country that are filled with the most exotic, unusual, colorful and dangerous fish in the world. ATM takes on more than 200 projects every year with tanks ranging from 50 to 50,000 gallons in size. Tune in Fridays at 9 PM E/P on Animal Planet. We arrived at Westfield Annapolis in Annapolis, MD. Select employees from the mall and members from the media were invited to the event. 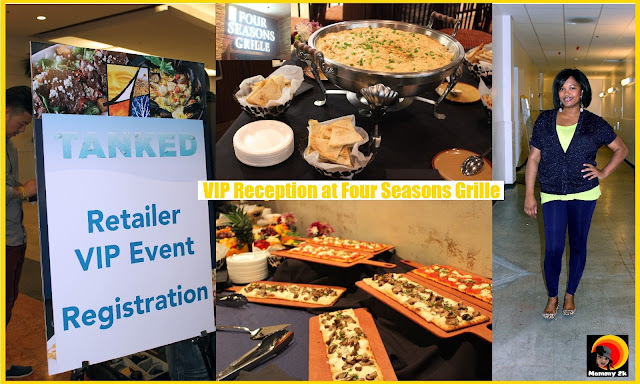 The kick-off began at Four Seasons Grille with light refreshments and a chance to mingle. Brett Raymer and Wayde King were on location to take pictures with the fans. Kaden and I caught up with Brett, who is very funny and laid back. He was all for taking pictures with everyone. Once the reception ended, guests were taken over to the filming area. Most guests were directed to a location where they could be a part of the show. Media was more behind the scenes. It took me awhile to figure out that we should have moved to the other side to be a part of the show. We were a bit upset about this, but it was still awesome being a part of the event. Besides, we had to make a quick run to basketball practice and did not want to disturb the filming process. Surprisingly, Liam stayed asleep for the entire event. 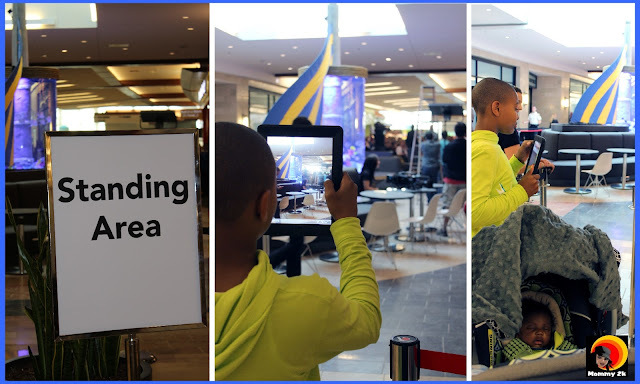 Part of the reason this particular location was ideal to get "Tanked" has largely to do with Westfield Annapolis being "one of few select malls in the country to accommodate families shopping with children, offering KidCare, Indoor Westfield Family PlaySpace, and the newest addition, the Family Lounge". This was a wonderful experience. I am glad I had the opportunity to take Kaden. He is a fan of the show. I am also thrilled that "Tanked" deemed our area worthy of their creative genius. If you want to see this episode of "Tanked", the show will be nationally televised on Friday, June 7 at 9:00 p.m. on Animal Planet (Time/day subject to change. Please check local listings). Don't forget to stop by Westfield Annapolis to see the new fish tank. It's a beauty. Westfield Annapolis are owned by the Westfield Group (ASX: WDC), an Australian-based company with interests in 119 shopping centers in Australia, New Zealand, the United Kingdom and the United States. 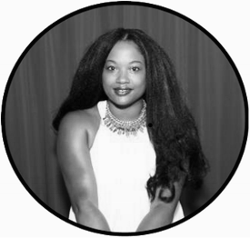 In the U.S., the Group has a portfolio of 47 shopping centers that are home to more than 9,000 specialty stores and comprise approximately 63 million square feet of leasable space in California, Connecticut, Florida, Illinois, Indiana, Maryland, Missouri, New Jersey, New York, North Carolina, Ohio and Washington. I was invited to attend this event thanks to Westfield Annapolis. My guest and I were provided food and the opportunity to witness the taping of Tanked. The opinions and views are my own.